Visitors come to the La Sal Mountains for a chance to experience the second highest mountain range in Utah, with 9 peaks rising to more than 12,000 feet. Popular area activities include hiking, mountain biking, horseback riding, and wildlife watching. Located approximately 20 miles south of Moab in the Manti-La Sal National Forest. Explore the area on foot, by horseback, or on a mountain bike. La Sal Mountain Loop scenic drive is a perfect way for armchair outdoorsman to explore the area. 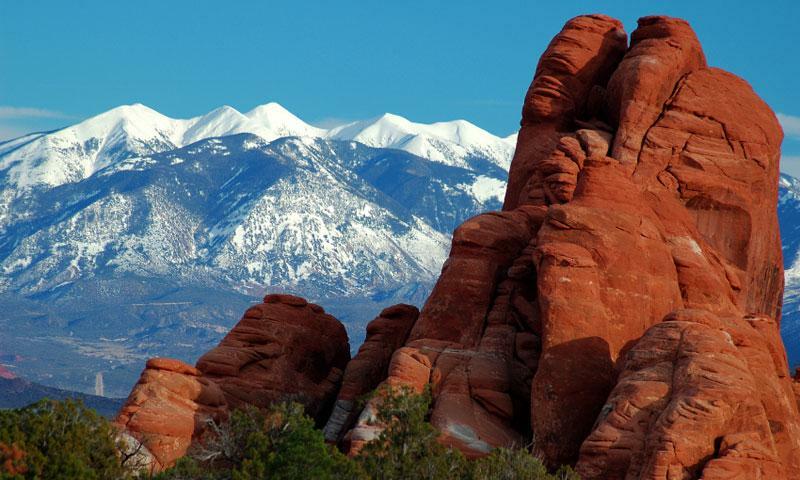 Boasting 9 peaks rising more than 12,000 feet above the Utah desert; The La Sal Mountains provide a convenient respite from the hot desert environment of the range’s foothills. Aside of their beauty, The La Sal Mountains have become renowned for their outdoor recreation opportunities include hiking, mountain biking, horseback riding, as well as winter sports. The La Sal Mountains are located in the Manti-La Sal National Forest approximately 20 miles south of Moab. As the La Sal Mountain Loop is kept snow free year-round, access is easy in any season. Horse Canyon Trail: Beginning at the base of Horse Canyon, this trail climbs almost 2,000 feet through beautiful Aspen groves and alpine meadows. The total trail length is four miles, so this is a great trail if you’ve only got a few hours to hike. This trail can be combined with several other trails for a longer hike, though for some routes, shuttle vehicles may be required. Gentry Canyon Trail: This five mile trail takes approximately four hours to walk. The trail climbs approximately 1,600 feet from its head in Huntington Canyon and passes through Aspen Groves and alpine meadows. Many side trips and extensions are available. Bull Pasture Trail: This steep five mile trail climbs from 7,300 feet to 9,400 feet along rocky mountain slopes. Along the way expect views of East Mountain, Huntington Canyon, and Gentry Ridge. The La Sal Mountains are a great place to observe the southwest’s unique and varied wildlife. Species include elk, deer, black bear, bobcats, cougars, red and gray fox, coyotes, and Golden Eagles. Though Moab reigns supreme as the areas mountain biking mecca, the La Sal Mountains have their fare share of riding opportunities. Most of the areas trails are multi access and can be used by bikers, hikers, and horseback riders. Horse Canyon Trail and Gentry Hollow Trail above are both open to bikers. If you’re looking to go further and see more, horseback is the perfect way to explore the La Sal Mountains. And since most of the trails are open to horses, you wouldn’t miss out on any of the areas breathtaking scenery. All the hiking trails listed above are also open to horses. La Sal Mountain Loop is a 60 mile scenic drive that winds its way along the Colorado River, and then through Castle Valley. Along the way you’ll be treated to panoramic views of the massive peaks rising above and the sweeping red rock canyons dropping away below. The routes terminus is in Moab. The road is kept snow free year-round. Cross-country skiing and snowmobiling are popular wintertime activities here. Though access maybe limited for snowmobiles, cross-country skiers can enjoy the same trails as hikers. Red Rock Forests is dedicated to the protection of the wilderness areas of the La Sal, Abajo, and Elk Ridge Mountains in southern Utah.